I’ve been wanting to try my hand at making gnocchi for awhile now, but there’s only so far I’m only willing to go for a weeknight supper. I recently watched Tyler Florence making gnocchi on TV, and while it does look straightforward enough (not to mention something the kids would love to help with, since it looked like potato play dough), I cheated with a package of store‐bought gnocchi but made the rest of his recipe, which comes together in less than half an hour. This is an ideal dinner for this time of year. 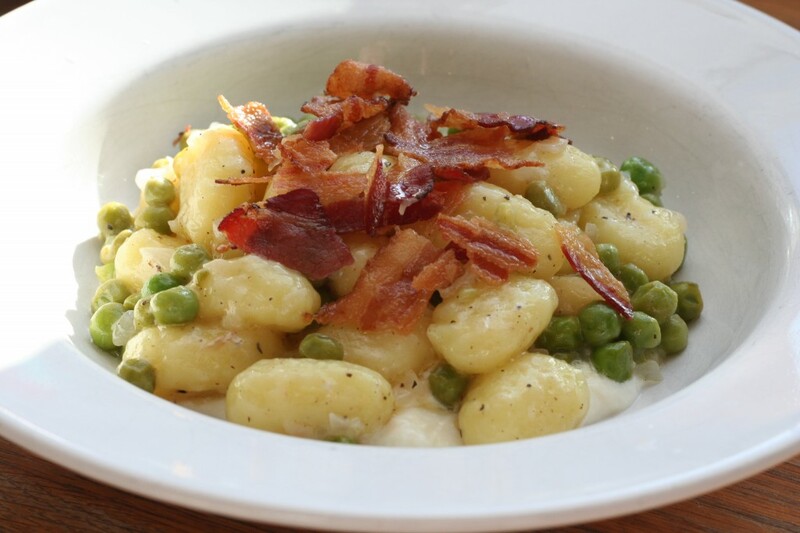 The potato gnocchi are still substantial and filling enough for spring evenings with a chill in the air, but the lemon brightens up the dish. Or if you’re having the kind of day where the last thing you want to face is cooking dinner, this requires minimal effort — the most taxing steps are chopping a shallot and zesting and juicing a lemon. This was lovely just as it is, but I can see it being a springboard for other variations, perhaps with a cream and lemon sauce like the one in this lemon fusilli instead of the ricotta and pan sauce, with broad beans instead of the peas or with some finely chopped fresh basil or mint added in. A peppery arugula salad on the side would be perfect. If you quickly blanch the peas first it will help retain their green color, but honestly, could you be bothered? I’ll happily settle for dull green peas here if it makes for an easier life. Preheat the oven to 350°F (180°C). (If using bacon instead of pancetta, preheat the oven to 400°F/200°C instead.) Bring a large pot of salted water to boil and cook the gnocchi according to the packet instructions (gnocchi usually only takes about 3 minutes to cook). Make sure you reserve about 1/2 cup (120 ml) of the cooking water for the sauce. While the water is coming to a boil, place the strips of pancetta or bacon in 1 layer on a baking rack placed on top of a sheet pan. Cook for 8 to 10 minutes, until the pancetta is crispy. (If using bacon, this could take up to 15 or 20 minutes at the higher temperature, depending on how thick it is; cook until browned.) Drain on paper towels, then roughly chop into bite‐sized pieces. Set aside. Heat the olive oil in a pan over a medium heat. Add the chopped shallots and gently saute for about 5 minutes, until fragrant and translucent. Add in the peas and toss gently to coat and heat through. Season with a little salt and pepper. Add the cooked gnocchi to the pan and gently toss. Add the reserved gnocchi water to the pan, then add the butter, sprinkle with the Parmesan and season again with salt and pepper. To serve, spread a generous scoop of the lemon ricotta on the bottom of each plate. 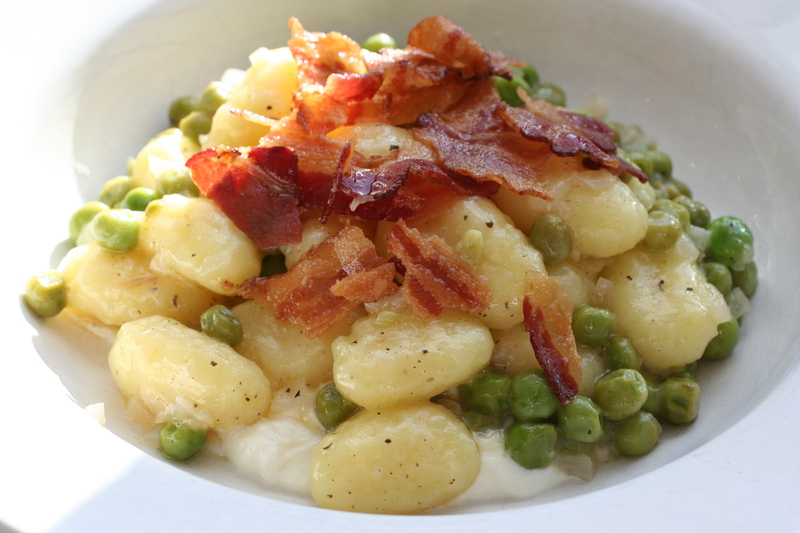 Ladle the gnocchi, peas and the pan sauce on top of the ricotta, then top with the crispy pancetta.